2) old style slingshot (my term ... sure there is a technical term out there ... need better term) EDIT: calling this Elbow Slingshot below. Curiosity was describing double pendulum with his nunchuks, and I tried with golf Iron Byron. If you have not read the link that Mntlblok provided to Rod Cross's TWU article on double pendulums, I highly recommend you do. It will be WAY more useful than what I am about to type. Following video link is from that article ... gives you a visual on what a double pendulum is. Note the baseball bat represents the forearm, and the dowel rod represents the racquet. Note the bat/forearm slows down near the bottom and the dowel / racquet speeds up. Flip: for this thread, there is no such thing as a flip if there is not some release of the initial double pendulum angle. - all FHs with bent elbow during forward swing (this varies from very bent (Sharapova) to some flex (Djokovic). The point of this analogy is the rotation of the forearm around the elbow (anchor) is a power source to consider in the variations of FHs. Will post example video in pics in followup posts. A double pendulum has no equivalent for internal shoulder rotation (ISR), that is, neither part of the double pendulum rotates around their long axes as for ISR. The double pendulum is a very misleading analogy - maybe less for the forehand - but especially for the serve. Titin is the slingshot for tennis strokes and it works like a band of rubber stretching. What biomechanical property does rubber and Titin have that is so important? When and why is it used for tennis strokes? Sorry ... just saw I had copied the link to the TWU article incorrectly. He applies the the double pendulum to the serve and forehand in that article. I wasn't interested in the calculations, just the concept of the double pendulum. Looks like he talks about rotation in the section torques and couples. IMO forearm-racquet pendulum applies to the flip on line to contact of ball. With "slingshot" I am trying to name the motion where the forearm rotates horizontally around the vertical upper arm... i.e. most WTA FHs, some ATP (Fed does not, hits with straight elbow). We need a better term for that ... I will change if someone comes up with better term. The terms have been well developed based on each joint and defined motions. Do you mean this motion? How to measure internal and external shoulder rotation. A great text is The Manual of Structural Kinesiology, Thompson, Floyd. The 15th is a very adequate edition for this popular college text. $10 used for one of these older editions. 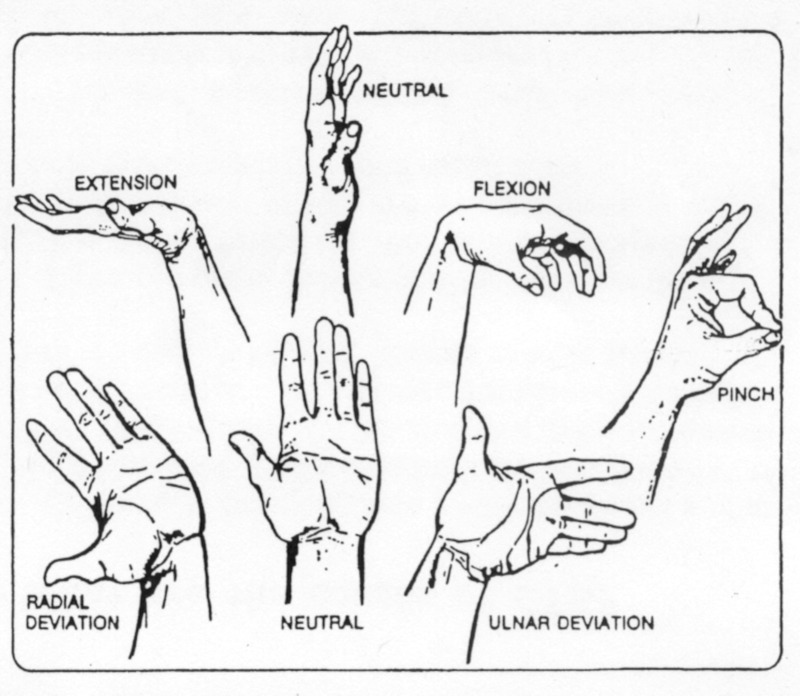 They make the defined joint motion terms crystal clear with names, text and illustrations. All are discussed and defined. Google works very well too but takes more time searching and selecting than a text with near everything. For internal shoulder rotation (ISR) and external shoulder rotation (ESR), whether the elbow is near straight or bent has to be known to understand the effect at the wrist. If the elbow is near straight ISR and ESR have the same result at the wrist as pronation and supination, respectively. If the elbow is bent that is not true. These terms are used both for joint positions (see measuring range of motion Youtubes and defined "0" degrees) as well as direction of motion. So you are saying Fed's straight arm shoulder rotation into contact, and Sock's shoulder in his bent elbow shot are both ISR? Seems that ISR covers quiet a bit of variations in that shoulder socket. But that doesn't solve my problem here. I'm not really after technical terms ... I'm trying to identify the major levers and hinges (from shoulder down) in the FH variations. You can watch Fed straight arm, and see nothing hinges around his elbow. With Sock, Madison Keys ... the lower arm horizontally whips around the vertical arm at the elbow.. the elbow is a hinge in those FHs. I'm not saying anything about what ISR, supination, has to happen to allow that lever/hinge ... just that it a major point where it is happening. - What matters more with rhs ... Fed's straight arm hit (longer lever) or Thiem's additional rhs from his elbow slingshot/hinging? - if you hit a flip with the same laid back hand position at the start of the flip AND at contact ... wasn't that flip useless and feeble ? Most of it would be speculation for sure ... but I bet most of us that have tried to hit a straight arm FH like Fed realize that is definitely more powerful no matter what gain is added at the elbow hinging. Going for non-technical here ... just identifying the pendulum and hinge power sources. Quit it. Wife got two hole in ones ... and I got zero. Did have some awesome trips to Scottsdale, AZ, however. I would start with who has the better forehand, Federer or Thiem? The answer is obvious, Federer. However, his straight arm forehand doesn't work as well for some players as a double bend forehand e.g. most players on the tour. So, whichever works best for you is what you should use. I'm out ... will post pics and video tomorrow. It's all in the isr, it's all in the isr, it's all in the isr ... NOT!!! Could you identify what parts of the body correspond to each of the two parts of the "double" pendulum? Do the parts of the pendulum correspond to masses at locations or do you mean two stick like objects? See pictures of double pendulums. 6) any other body parts. Here are some pictures of double pendulums. [To post a picture. Get the picture to appear the right size by clicking on one of the allowed pictures above. Right click on the picture, select Copy Image Location. Open the TW "Reply" box and click the icon above the Reply box that looks like two mountains and the moon. A box appears, paste the copied Image Location into it. Chas ... reminder, just FHs, and I am interested in the space called "logical observation and speculation" ... or "semi-scientific" as Draggy tagged me. I like that label, btw. You are much more technical than I am. Pendulum examples, followed by the arm parts you asked for. - any FH where there is no flexion or ulnar ( http://67.media.tumblr.com/tumblr_lyrasmAzFS1r03vsro1_1280.jpg ) release during swing to contact (i.e. Sharapova). Thanks Bender for the hand movement pic. Here are three pivots of the body. I don't know which two pivots to think about for the forehand's double pendulum. Look at my post above ... I just bolded (FH double pendulum occurrences:), it is under that. I will put player pics up soon as examples. I don't understand these words. "All FHs shoulder -> upper arm..."
If you need any help posting pictures, let me know. Also, the Windows "Snipping Tool" will allow you to copy anything on your screen and add a few crude free hand lines, arrows or letters. You still have to upload your picture to a photo hosting website in order to post it on the forum. Kinovea is a free open source video analysis program. It is not difficult to use. Latest 8.25 version links are in this Kinovea thread. I just started using some of Kinovea's advanced capabilities and it is fun to use. For those that are interested in video analysis, I can answer some of the simpler questions on this forum. Thanks for the tips. Yes ... I am using the snipet tool ... did not know it had drawing function ... will check that out. Will also check out the video tool ... that sounds good. I think I used imgur for the few pics I have posted. Didn't create account ... so could not find again to delete. Will setup/create account. I have tried with my amazon prime pics ... but TW messageboard just shows missing pic img. I have a valid url ... which works fine from a new browser tab. I thought it might be TW blocking amazon links ... but those appear to work ... at least in preview mode. I would prefer to use my amazon prime pics. If you read that TWU article at the top, he does a pretty good job at defining a double pendulum. It's two pendulums ***, attached at a hinge point. I'm will be using this action to speculate about power/rha/rhs in different FHs. I'm abusing the definition below a lot (Rod Cross did to I guess) ... because it's swinging down with gravity. I still think it's really good for the analogy ... we can always go back to Curiosity's Nunchuks. Loved that one, actually. *** Pendulum: A mass hung from a fixed support so that it is able to swing freely under the influence of gravity. I will try and post pics later today ... about to watch a football game. So to your question ... first pendulum is shoulder blade turning around (anchored to) torso. The hinge is the shoulder socket. The upper arm (humerus) is the second pendulum. Right click on one of my pictures in an earlier post. Click "copy image location" NOT 'copy anything else'. You now have copied a valid "image location". Post that in the icon that looks like two mountains and a moon above the TW Reply Box. The picture should appear in the Reply Box in your message. You can practice and then cancel the reply. The Snipping Tool graphics capability is very minimal a pen with colors, a highlighter and an eraser. All is free hand not directly on the image but through a mouse, impossible to get a straight live or connect two points. For working with videos, Kinovea has a lot of well done graphic additions such as the angle tool. Lines, arrows, circles, text. It is quick to make pictures from the video frame. The time scale belongs in all stroke study videos and the countdown mode is going to be a basic tool for stroke studies and comparisons. I don't like the pendulum analogy because there is no place for internal shoulder rotation and the muscles have two systems for producing forces: 1) the Actin & Myosin system (like people walking or running to pull a rope)and 2) the Titin system (spring like). The hinges and ball joints and bones are similar to pendulums. Gravity is one force present for a freely hanging pendulum. But there are those other muscle forces for a tennis stroke. Youtubes of simple double pendulums show interesting motions when pivots allow 360 d of rotation. 2nd pivot allows 360 d motion. Cross with tennis racket. No analogy for upper arm (long axis) rotation. Awesome ... move over double pendulum ... new king in town ... Trebuchet Siege. Actually ... we will be ok with the double pendulum with most FHs ... but with Shroud lumber and kevlar we will bump up to Trebuchet. Good find. This is the first time ever for me to see a Balearic Slingshot sport. Never heard of it before! I could play this sport all day long. do you ever consider thinking of the racket like it is rope? Edit: I read that as "arm" ... which got a quick no. I think the lockandroll drum analogy is WAY wrong. You obviously get a lot of acceleration passed on from the shoulder to the upper arm, but from there the arm stiffens (particularly the upper arm movement from the shoulder) ... and then adds to that acceleration. You can watch player after player video and just watch arm movements start pretty much exactly as the shoulder starts forward to see the arm isn't a whipped rope. But then you said "racquet" ... and perhaps the implication of "flex"? Either way ... the racquet as a "rope"... no. The racquet as the second pendulum with the flip ... yes. Obviously racquet specs, weight, flex, hoop flex, string and string tension all bigger factors besides simple double pendulum analogy ... but I think the analogy\speculation as to FH power sources might actually be a decent one. fyi ... a very good player to watch for arm involvement is Fed since he straightens his arm when the shoulder starts forward. I have a triple pendulum forehand - at the shoulder, elbow, and wrist. You and Thiem ... shoulder turn with bent elbow and a nice flip. Good for you. Edit: I read that as "arm" ... which got a quick no. Even though the racket is some type of stiff, I intend to swing it like it is a rope. Imo, part of why it is called a tennis "swing". Some rackets have been built with a hinge to simulate this feel. It can be done with a sock and tennis balls as well like with the serve. OK ...if you want to call the racquet from pat the dog to contact ROPE ... whatever works for you. But for this thread ... that racquet/rope in the flip is the second pendulum. Warning: this thread is for fun ... a little theory and a lot of speculation to follow. I would like to spur conversation ... theory ... crazy wild guesses. I will post player pics, with my comments. Add your own players, or comments about the ones I have posted. The point of this thread (if there is one) is to observe\speculate about the power sources of different variations of the Forehand. The pros were able to match or add power to the traditional McEnroe type of forehand with shorter backswings. Everything being equal, a shorter backswing would produce less rhs. They obviously added components to make up for the shorter backswing. 1) the loop ... I think for all practical purposes the loop is a component for preparation and timing, but the racquet drop is insignificant in adding RHS. The rha, IMO, starts from the point the hand starts forward. 2) I don't think this is because of any brand new coiling and uncoiling ... I think McEnroe was turning his hips and shoulders back then to. I think the coiling/uncoiling (k-chain thing) changed in timing to service the different FH components of the new FHs ... WTA/ATP ... variations. I expect there to be "strong discussion" coming on this topic. 2) elbow slingshots (yeah ... really grasped for a word/term there). 3) later release (closer to contact) accomplished by 1 and 2. For all practical purposes, McEnroe's release happened at the shoulder ... and players have added components that allow extra releases closer to contact. Note ... they all have shoulders still ... and they pretty much work the same. No doubt I am stretching the definition of double pendulums, and just flat out made up elbow slingshots. But tennis FH components seem analogous to double pendulums and that rotation around the anchored elbow thing (elbow slingshot). 4) two pendulum working together from a hinge point is a major source of increased speed ... one pendulum by itself with equal centrifugal force and an equal length of pendulum #1 + pendulum #2 can't match it. (think golf swing without cocking\hinging the wrists ... weak tea golf swing). Also think golf swing ... release the wrists at top of golf swing (casting) rather than late release , and yet another weak tea golf swing. 5) the greater the angle between pendulum #1 and pendulum #2 before release, and the later the release, everything else being equal, should provide max speed. Edit: The flip is definitely a double pendulum with the hand as the hinge. But what about a forehand without a flip, but the hand lays back in forward swing, and then goes back to neutral by contact. I have to say that is a double pendulum also ... just weaker compared to full flip. EDIT: Added terms Simple Double Pendulum and Flip Double Pendulum in first post. Elbow slingshot: forearm rotating around an anchored bent elbow. Note: Player FHs surely can vary, comments below and neutral baseline shots. Comment: Straight arm all the way with hand\wrist positions in backswing pretty much the same at contact. Probably adding wrist action sometimes ... but not double pendulum worthy. Edit: Note McEnroe's contact point contact point vs Federer below. Mac got to max rhs from his backswing pointing at the fence to this contact point. Federer introduces a second double pendulum around his hand, so he has no choice but to hit it out more in front for the flip to achieve max rhs (not saying that is the only reason he hits it out in front ... just he needs the acceleration distance). Comment: That's about as max an elbow slingshot could be, I would think. Not good pics, but in the second one, the entire arm and racquet are on straight line whipping around the elbow. Comment: Sharapova seems to have a neutral hand position at backswing, then lays back in forward swing and maintains it to contact. No flip, and no release of laid back hand by contact, therefore no double pendulum around hand. EDIT: Here is an important question I think. Could Sharapova add significant RHS to her forehand by adding a Simple Double Pendulum by contact? Comment: Thought I saw some release of laid back hand, but changed my mind. She seems to hold her hand position to contact like Sharapova. Question: I guess the point of a relaxed wrist in this type of FH is to allow the hand to lay back in the forward swing, and then hold that position until contact. This seems different for someone allowing the wrist to return to a more neutral position by contact ... need to be relaxed also toward contact so the racquet will turn the hand as it releases (otherwise, we would be back making claims about an active release of the hand/wrist toward contact). EDIT: So no simple double pendulum, no flip double pendulum ... and yet she hits the crap out of the ball. I have to say Madison surely challenges a lot of theories, including RHS added by flips, and double pendulums for that matter. Ouch. Comment: Federer has variations in FHs, but on this one he has both types of double pendulums around his hand (Simple and Flip). Plus ... he hits with a straight arm. My logic says the straight arm trumps the elbow slingshot, so IMO ... Fed's FH components are the gold standard for creating the max RHS for a given acceleration delivered from the shoulder. Comment: So Thiem is an example of all the possible FH double pendulums PLUS a elbow slingshot. Also note his backswing in getting back there in WTA territory ... more than one way to flip. Question: Thiem has an extra double pendulum (power source) in his FH over Federer with the elbow slingshot. But Fed has the longer second pendulum from the shoulder with his extended arm. Which one should provide more power? Comment: So Thiem is an example of all the possible FH double pendulums PLUS a elbow slingshot. 1) In general, the shoulder blade is not anchored to the torso. Google its motions. It is not a hinge or ball joint but floats on the body held by many muscles around its outer edge. In my opinion, it appears to move in the Thiem forehand. Since the shoulder blade is close to the body, the movement may mostly result in angle changes. The shoulder blade's movement is not so easy to distinguish from a defined shoulder joint motion. The shoulder blade moves the the shoulder socket and upper arm forward and the shoulder joint itself also moves the upper arm forward. Basically, the body is full of little joints that all add up to result in the apparent motions seen in videos. The double pendulum only covers two of those joints. What effect do these shoulder blade motions have on the angle of the upper arm? 2) Pendulums seem to move in only one plane, be limited to one plane. But Thiem's forehand motion is in more than one plane. 3) Thiem moves in 3D, in particular his upper arm rotates with ISR for racket head speed. Pendulums do not have the upper segment rotate. Pendulums are simpler, they swing in one plane. I can't see how the pendulum analogy can include the ISR. 4) "pendulum #2 - arm + hand + racquet" this is more that one pendulum unless some joints are fixed. The elbow is a joint and has little elasticity. What about the elbow is a 'slingshot'. The muscles attached near the elbow joint have elasticity. Should those muscles be the "slingshot"? Muscles change the angles of joints as the joints themselves stay in one spot. Are we making things clearer to understand by taking an extremely complex 3D motion like the forehand with a lot of variety and attempting to describe that motion in familiar everyday terms, starting from scratch and ignoring all the earlier research. If you study a video you can see more and more detail in it. If you say a forehand is like a double pendulum except for these other details that we see in high speed videos, are we gaining? I use a sling shot analogy for a very simple part of the serve, the elasticity of the muscles that is similar to a rubber band. For these simple concepts analogies can be very useful. But for a 3D service it is much more difficult. 1) Pendulums seem to move in only one plane, be limited to one plane, but Thiem's forehand motion is in more than one plane. 2) Thiem moves in 3D and in particular his upper arm rotates with ISR for racket head speed. Pendulums do not have the upper part rotate. Pendulums swing. The elbow is a joint and has little elasticity. What about it is a 'slingshot'. The muscles attached near the elbow joint have elasticity. Should those muscles be the "slingshot"? Are we making thing clearer to understand by taking an extremely complex 3D motion like the forehand with a lot of variety and attempting to describe that motion familiar everyday terms, starting from scratch and ignoring all the earlier research. If you study a video you can see more and more detail in it. 2) indentify and discuss, debate main power sources of the shorter swing FHs. This is not intended to be a discussion of kinesiology. ISR rotation. IMO, added power comes from the flip (double pendulum around hand) ... and ESR/ISR helps make that happen. The power isn't the ESR/ISR ... it's the flip that happens from it. In this thread I'm just observing the power sources, a double pendulum around the hand. You mention multiple planes. I am talking about flip to contact. I view that as one plane to contact. Someone else pointed that out ... I hadn't thought of that before. Either Bender or Curiosity. The bigger stretch with the analogy is the line/plane with shoulder blade and upper arm ... but hey, I'm not charging anything for this post. You are still missing the slingshot analogy ... you are stuck on the "stretchy" thing. That's why the initial post of "old style slingshot" ... they weren't "stretchy". Did you watch the video in my initial post. That video alone made it worth checking the thread ... that was frickin amazing he could hit that target. But the analogy is the slingshot whipping around an anchored point (hand in that instance). With the bent elbow FH, the elbow is the anchor/hinge rotation point. The elasticity of the elbow has nothing to do with it ... it is a anchor rotation point.
" Why not just talk about joints and bones where the terms are defined and 2000 years of kinesiology progress is available." Because this thread was for fun ... and that can get boring. Not trying to teach FH in this thread ... just observing FH evolution with silly analogy. I say silly ... but that double pendulum is real science ... not even semi-science. Comment: So before I had heard of the term double pendulum, or ESR or ISR, I had watched a lot of Federer and Djokovic FH video. I basically got it pretty quick ... except for the initial part of the flip. If it had been as simple as the wrist laying back and then being back to neutral at impact (simple double pendulum) ... then I would have also got that right out of the gate. To me ... there had to be a release of that 90 degree +/- lag by impact, or what was the point (at least for RHA/RHS). I didn't know the term double pendulum... but turns out that is exactly the action I thought had to be there or you were just turning a 90 degree angle with no payoff(at least for RHA/RHS). I have spent a lot of time trying to understand what is going on (with some grips and some flips) besides just laying back wrist (extension) and moving back toward neutral (flexion ... or flexion direction). Well... for the point of this thread, it doesn't matter. I highlighted Djokovic's forearm to racquet angle in the 2nd pic (flip) and 3rd pic (at contact). However it happens, the double pendulum released from approx 90 degrees to ... let's call it 10 degrees. In other FHs ... particularly Nadal, Thiem, that angle can be much larger ... I would say the potential RHA from the flip much higher. Here is a pretty clear example of the power of the double pendulum. A guy the size of Sergio Garcia can play pro golf in part to the extreme angles (double pendulum) in his golf swing. The key is amazing late release of the club (angle from forearm to golf club). That is pretty much what is going on with the flip ... the players figured out how to match that late release in the golf swing. Check your golf swings to that one ... good luck with that. You should be able to study this by getting two sticks and joining them together, hinge (one plane motion) or two eyes with screws, chain links, rope, etc. Swing them as the elbow moves the forearm and racket - your red lines - in tennis player's forehands. It could be very interesting. My view is that the red lines have muscles attached near the pivots that can act like springs when they are stretched during lagging. The muscles can also follow nerve signals and apply shortening forces or lock up the arm to keep joints fixed. If you use two sticks those springs and forces are not there. For a tennis stroke it is difficult to know what forces are there, if any. We might learn some interesting things about what the oft said 'relaxed arm' is? It's not that much by contact. You can't just measure the angle on that picture - the "projection on the screen" has larger angle that the actual arm-racquet angle. The point with your double pendulum is first instance acceleration, the speed peaks very early through the "release". Even slight difference in racquet/arm angle by contact is a marker of the "second pendulum" acceleration. fyi ... I have decided calling the shoulder action a double pendulum is too lame, even for analogy purposes. I will edit posts soon. I had the thought to highlight the shoulder blade - upper arm angles, and that takes about 2 seconds to see there is no double pendulum angle preset. If you hold your arm extended straight out from your side, you can move your arm back a little, but that is not what we do with the FH. Yes ... guessed on 20 degrees … almost typed 10 degrees. I think maybe this observation of double pendulum angle release is part of what has to exist in order to call something a "flip". Said another way ... you could have a double pendulum around your hand in your FH without a flip, but you can't have a flip without the double pendulum angle release (at least some). Djokovic's shoulder joint moves. It's not lame, it's reality making things complicated. There is old research on the forehand identifying the contributions of each joint to racket head speed at the instant of impact. The original work shows the time before impact. Biomechanics and Tennis, 2006, Bruce Elliott has a table showing the main contributors - the joints - to racket head speed at impact for both the serve and forehand. Easy to read review paper.